Houchen Bindery Ltd President Damon Osborne and Sales Representative Tim Benson attended the 2015 NLA/NSLA Conference in Lincoln, NE. The conference is a great opportunity to visit with many of the librarians we work with throughout the year. 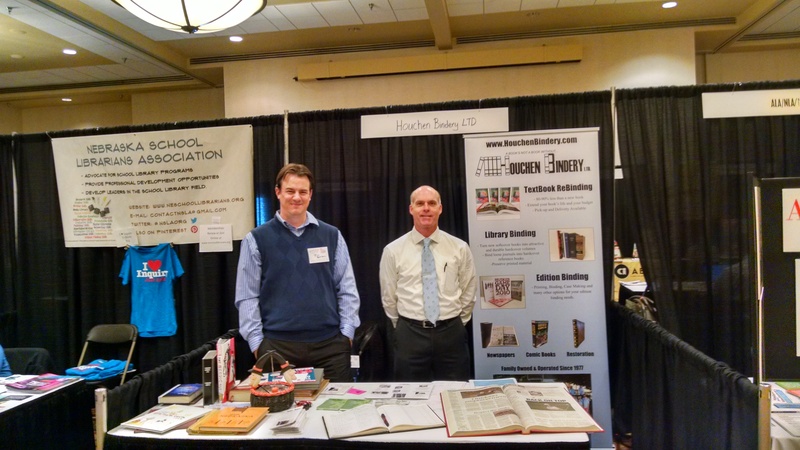 Houchen Bindery Ltd is proud to continue its support of New Librarians and their mentors. The Houchen Bindery Beginning Professional Award is a cash prize sponsored by Houchen Bindery LTD. It is awarded to a beginning librarian or media specialist who has made significant contributions to library and/or media services in the early stages of his/her career. Stretching the Book Budget with Binding. Margaret Emons and Terri Raburn from Wesleyan University hosted a session about using binding and rebinding books to save the library money. They purchase soft cover books and have them bound into more durable hardcover books. This saves the library time and money, and extends the life of each book on the shelf. It also makes the books more attractive to students. Thank you Margaret and Terri for a great session!